What's Matt Beleskey's Ceiling For the 2015-16 Bruins? What’s Matt Beleskey’s Ceiling For the 2015-16 Bruins? The offseason for the Boston Bruins has been nothing short of intriguing. A new general manager, arguably two franchise-altering trades and a month-long saga regarding Claude Julien’s job security have been some of the major storylines going down on Causeway Street. However, what may get lost in the shuffle is Don Sweeney’s musings in free agency. The most talked about name on the big board was one Matt Beleskey. I vividly remember fans taking to social media to express their (at the time) displeasure on reports the Bruins were talking to him. I thought it was a sure thing that Matt Beleskey's new contract would be over the top and stupid. When did NHL GM's get so smart? That is, until they saw the contract. At five years, $19.8 million with a no-movement clause the first two seasons, Beleskey came at a much lower price than anticipated. Indeed, five years is a big commitment to a guy who set career-highs in goals (22) and points (32) last year. The no-movement clause reminds us of the mistakes of the past regime of Peter Chiarelli. The money? Well, a $3.8 million cap hit for a potential top-line winger is not too shabby. The 27-year-old Beleskey has a bit of pressure on him this season. His play last season earned him a five-year deal, but now the challenge is going to Boston, learning a new system, and developing chemistry with his linemates. 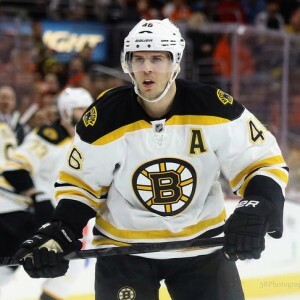 What can Bruins fans realistically expect from their “major” free-agent acquisition this season? Before the start of the 2014-15 campaign, people outside of Anaheim had no clue who Beleskey was. After all, a guy who scored just 35 goals and 80 points in 264 games isn’t worthy of getting much press. Out of nowhere, the Ontario native set career-highs in goals, points, average ice time per game (14:29) and shooting percentage (15.2). In addition, his even-strength Corsi-For number (53.5 percent) was over six points higher than his career total (47.3). Beleskey also scored eight goals in 16 playoff games; none bigger than this overtime winner against the eventual Stanley Cup champion Chicago Blackhawks in Game 5 of the Western Conference Final. Not bad for a guy who was an unknown in almost all NHL circles. Now in Boston, Beleskey will be one of the focal points amongst the forwards. 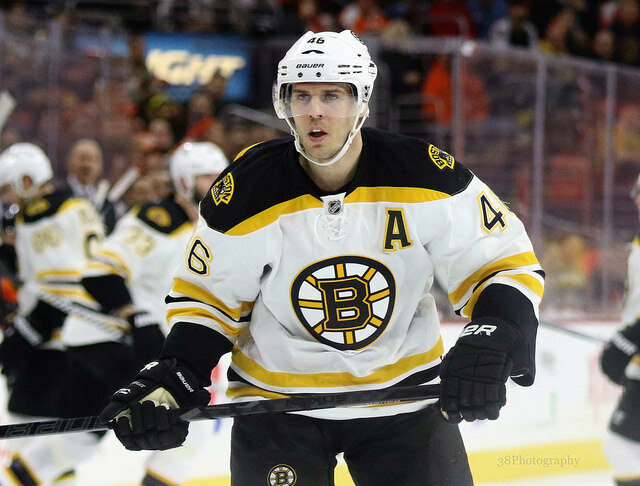 The left winger is the early favorite to occupy Lucic’s former post on the top line with David Krejci as his center and possibly Loui Eriksson on the right side. Both are solid, veteran players with great vision and will find Beleskey more often than not for his fair share of scoring chances. It depends on whether or not the former fourth-round pick in 2006 can bury them with great aplomb. Beleskey will be in an ideal situation to show the NHL last season was not a joke and evolve into a more consistent scorer. A lot of people were skeptical when news was first reported that Boston slowly emerged as a front-runner for his services. Fans were leery of signing a guy to a longer-term contract based off one good season, as had been done so many times under the Chiarelli regime. Now that he is here to stay, Beleskey will have an extra bit of heat on him from the Garden faithful. A no-movement clause in the first two seasons is an improvement over the past but is still a bit concerning given he will have to learn a new system “on the fly” this season. Playing at the TD Garden is nothing like the Honda Center. Boston has a much more passionate fanbase who knows the game well. In a sold-out building of 17,565 for 41 games, the pressure may be too great for someone with an inflated contract. Can Beleskey handle the adversity he may face in the Black and Gold? This number likely depends on where the former Anaheim Duck will slot in at the start of the season. Early indications seem like Beleskey will start the year up top with an underrated playmaker in Krejci and a consistent 20-goal scorer in Eriksson. This bodes well for the entire line as a whole, provided that Krejci stays healthy. The Czech center missed 35 games with various injuries last year and the Bruins struggled to create much of anything while he was out. As I said earlier, Beleskey will have his opportunities. How well he finishes them may decide where the team is with regards to the playoff structure. He will hover around the 20-goal mark but it’s hard to see him pushing 25-30 in his first season with a new team. In terms of overall point totals, Beleskey should accumulate between 40-50 with the linemates he’ll be playing with. How well do you feel Beleskey will do in his first season with the Bruins? Leave your thoughts here or get at me on Twitter.